On 19 and 20 June, in a muddy field ten miles south of Brussels, 6,000 performers and 300 horses will take part in a unique dramatic event. Two hundred years since the battle which decided the fate of Europe for a century, enthusiasts from all around the world will commemorate its bicentenary, by re-enacting the Battle of Waterloo on the original battlefield. 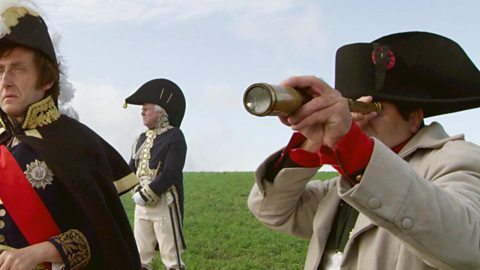 6000 re-enactors are expected to commemorate the 200th anniversary of the Battle of Waterloo. Photo courtesy Phil Thomason. I first came to Waterloo in 2010, to watch the last big re-enactment. I must admit I wasn’t expecting much: a few overgrown schoolboys dressing up as soldiers, reliving those childish war games we used to play at primary school. I couldn’t have been more wrong. It was one of the most exhilarating performances I’ve ever seen. It felt like a cross between an epic movie and a cup final. Have you seen Waterloo, the 1970 feature film with Rod Steiger as Napoleon? Do you remember the thrilling finale? This re-enactment feels a lot like that, but in three dimensions, with the whiff of grapeshot in your nostrils. It’s the ultimate expression of theatre in the round. For most spectators it’s just a bit of fun, but these re-enactors take it really seriously. Like proper actors, they immerse themselves utterly in their roles. They remain in character for several days, from when they pitch their tents on 18 June (the actual anniversary of the battle) until they strike camp on 20 June. Indeed, visiting their bivouac camp is just as atmospheric as seeing them in action. These Napoleonic soldiers cook makeshift meals over open fires, just as they would have done the night before the battle. Of course this cast of thousands is just a fraction of the numbers involved in 1815, when Wellington held off Napoleon until Blucher’s Prussians arrived to save the day. Napoleon had 73,000 men, Wellington had 68,000 and Blucher had 50,000. The arithmetic was simple. If Napoleon could fight Wellington and Blucher separately, he had a sporting chance. If they joined forces (which they managed to do, eventually) he knew he was finished. The battle was all over within a day, but in a bid to please both sides these re-enactors are staging two different phases of the battle on two separate days. On 19 June, they’ll re-enact the French attack (which came very close to victory). On 20 June, they’ll re-enact the Allied counterattack (though it was Blucher’s arrival, more than anything, which proved decisive). Patriotic Britons still tend to think of Waterloo as a British victory over a French foe, but the reality was a lot more muddled. A quarter of Wellington’s troops were Dutch and a third of them were German. Napoleon’s soldiers were recruited from all over Europe. Fittingly, these re-enactors are also a hotchpotch of different nationalities. You hear German and Dutch voices around the Allied campfires, just as you would have done 200 years ago. There are Napoleonic soldiers from as far afield as Eastern Europe, just as there were in 1815. Belgians fought on both sides at Waterloo, which may explain their ambivalence about the outcome. Napoleon is regarded a lot more benevolently in Belgium than he is in Britain. Here, he’s seen as an enlightened despot, rather than a pantomime villain. For these dedicated re-enactors, this performance isn’t merely an entertainment. It’s also a sincere homage to the 40,000 men who died at Waterloo. As you walk around the battlefield, you come to understand their point of view. This is still a powerful, sombre place. Despite its proximity to Brussels, the scenery has hardly changed. The three farmhouses which were the focal points of the battle are all still here, and so are the two roadside inns, only a few miles apart, where Napoleon and Wellington spent the night before the battle. Today they’re both museums. There are various memorials, but hardly any modern buildings. Two hundred years later, Waterloo remains an open plain, a natural amphitheatre surrounded by a ring of wooded hills. Is battle re-enactment an artform with a future? Or, like old soldiers, will these re-enactors slowly fade away? Other battles may be forgotten, but our fascination for Waterloo seems destined to endure. This is the biggest battle re-enactment in the world, and this year’s is bigger than ever. I’m ashamed to say I used to look down my nose at these re-enactors. I thought they were far too old to be playing soldiers. Now I’ve seen them at Waterloo, I believe they’re performing a noble function. They’re doing something communal and creative, instead of playing solitary war games on computers. They’re educating the general public. They’re inspiring future generations. The re-enactors remain in character for several days, from when they pitch their tents on 18 June (the actual anniversary of the battle) until they strike camp on 20 June. Photo courtesy Katia Chaval. The soldiers cook makeshift meals over open fires, just as they would have done the night before the battle. Photo courtesy Phil Thomason. The film is being screened at the Memorial of the Battle of Waterloo museum.